Beer and football go together like £10 Champagne and footfall, so there is no better time to promote world beers than the impending World Cup. 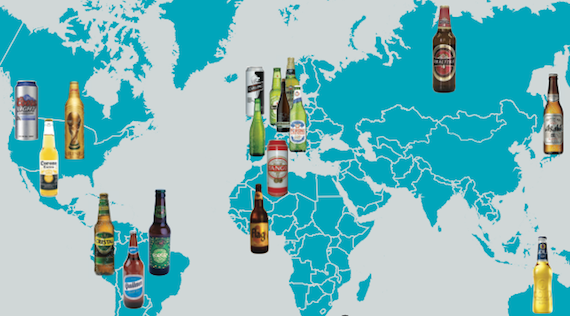 During the 2010 World Cup beer and cider sales were 34% higher than average (IRI, four weeks to July 2, 2010) and lager was the main driver of this. Four years later the greatest tournament on the planet returns to its spiritual home in Brazil, and more than 20 million Brits are expected to regularly tune in throughout June as Steven Gerrard and co compete with the might of Spain, Argentina, Germany and the host nation in a bid to capture the famous trophy. Budweiser is the tournament’s official beer sponsor and has a range of limited-edition SKUs and a broad marketing campaign. UK marketing manager Jennifer Anton says: “While football brings out regional pride and fierce rivalries, it also brings fans across the globe together once every four years through shared passion. But Budweiser’s monopoly of the above-the-line marketing hasn’t stopped rivals ensuring they cash in. Heineken will be aggressively promoting the likes of Kronenbourg 1664, Foster’s and its eponymous lager, and Craig Clarkson, category and trade marketing director, says: “The World Cup is the godfather of all televised tournaments and is expected to be viewed by 60% of UK adults – 24 million people – this summer, 83% of whom will watch it in their home with friends and family [HIM 2010 World Cup survey], significantly increasing the number of at-home food and drink consumption occasions. “For retailers, the World Cup offers a key trading opportunity that comes just once every four years but, just like the teams that compete in Brazil for the coveted trophy, retailers will need to produce a world-class performance to emerge as winners. Graham Archibald at Morgenrot believes the distributor is ideally placed to capitalise on the World Cup because its portfolio includes beers from strong footballing nations. “When it comes to the football, it’s advantageous to offer beers from nations which are expected to do well at the tournament as opposed to stocking beers from every obscure country,” he says. Another distributor, which is conveniently named World Beers, has launched two Brazilian beers from brewery Amazonia into the UK off- trade. Managing director Peter Karsten said: “There is a host of brilliant sporting events this year which I am sure the off-trade will be licking their lips about. With the Commonwealth Games, the football in Brazil, the cycling or even the Ryder Cup, we are spoilt for choice – so let’s just hope we get some good weather as well. “To compete against the multiples, independent off-licences have to look to offer a point of difference rather than just price promotions. “We have recently launched two beers from Brazil’s leading craft brewery, Amazonia, to take advantage of the sport-filled summer and consumer trend for craft. The two beers are premium quality, perfect for summer, beautifully packaged and tap into a real consumer trend for unique and creative brews.